Grace Cafe occurs at 10AM on Sundays between the 9AM and 11AM Church Services. We do not meet during the summer service schedule. Take a delightful and comprehensive journey through The Book of Common Prayer, the Christian life, and basic beliefs of our faith, guided by two Episcopal priests. Walk through the liturgical year, the sacraments of the church, habits of daily prayer, and the teachings of Anglican Christianity. See how our prayer shapes our belief and our lives and how our beliefs lead us into a deeper relationship with Jesus Christ. 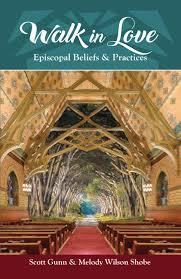 Walk in Love is a comprehensive look at the practices and beliefs found within the Episcopal faith. If you are a potential new member from another denomination then this study will qualify as an Explorer Series instruction for church membership at Grace. This is also an excellent overview for members and opportunity to think more deeply about our faith. You will also need your own copy of the 1979 Book of Common Prayer. Or if you prefer, there are also free digital versions: Downloadable: http://justus.anglican.org/resources/bcp/formatted_1979.htm.